Additional considerations when buying a necklace or pendant are: the type of chain, the clasp style, and the clasp assembly. Clasps are integral pieces to any necklace or bracelet and come in a variety of shapes and sizes. Bringing both ends of the necklace or bracelet together to a secure close, clasps don't always have to be purely functional. Many clasps are integral parts of the overall design of the necklace or bracelet. Chains are a series of connected metal links or loops with an attached-clasp assembly. 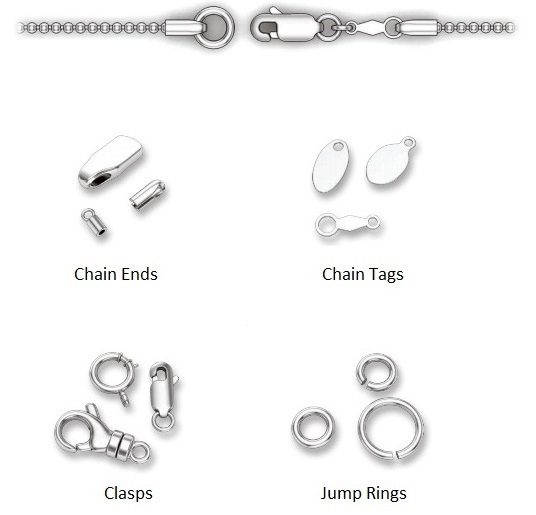 There are several variations of chains, and the most popular are omega, rope, and box chain styles. When purchasing a diamond pendant, the chain is included. Typically, a fine jeweler will include the chain in the same metal type as the pendant. The clasp is the mechanism used to attach both ends of the chain. 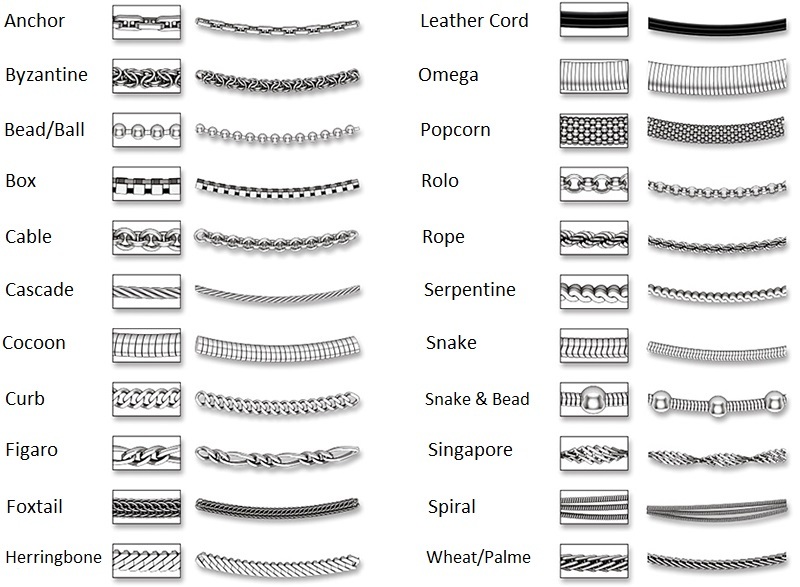 The style of clasp used by the jeweller usually depends on the item. 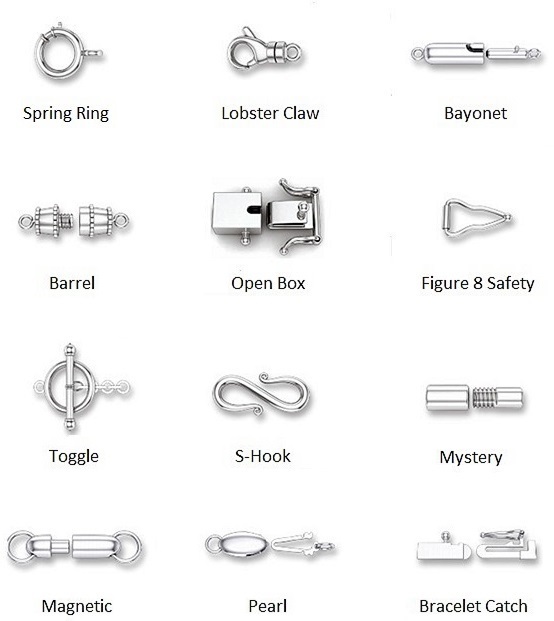 There are many different styles of clasps including the barrel, lobster claw, and spring ring. 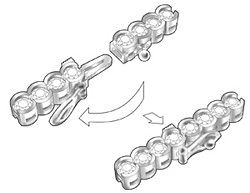 The entire clasp assembly refers to the mechanism used to secure a chain. It typically consists of both a chain end and clasp. Parts of the assembly are evaluated for sturdiness in regards to any clasps, ends, rings and tags. A quality assembly should not feel like it could be easily broken. 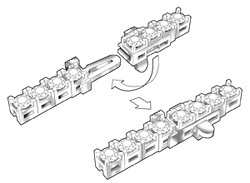 Box clasps are two-piece clasps that open when the exterior side lever is pushed, compressing the mechanism so that it slides out of the opening. To close, simply push it back in and it will easily click into place. While not as strong as other clasps, such as the lobster claw, box clasps are ideally suited for both necklaces and bracelets and can be highly decorated. The hook and eye clasp is a simple hook on one end of the bracelet or necklace and an "eye" piece on the other end which is usually shaped like a figure eight. Hook and eye clasps work well for both necklaces and bracelets but is typically not as secure as other clasps such as the spring clasp. Probably the most popular clasp, lobster claw clasp is a secure clasp ideally suited for both necklaces and bracelets. This clasp has a small spring mechanism that keeps the arm or claw closed. Lobster claws are easy to open and can be styled to fit the design of the bracelet or necklace. A magnet clasp is a simple clasp that uses magnets at both ends of the necklace or bracelet. When the ends are brought together, the magnets quickly snap shut. Magnetic clasps are secure, easy to close and work well for both necklaces and bracelets. The oval trigger clasp is similar in function and look to the lobster claw clasp with the exception of its oval shape. This clasp is suited for both necklaces and bracelets, is very secure and easy to use. The s hook clasp consists of a dramatic s-shaped piece of metal on one end of a necklace or bracelet. On the other end is an opening like a hole or square. The s-shaped piece simply hooks into the other end of the necklace or bracelet. This type of clasp can be used for both necklaces and bracelets and can be a highly decorated piece. While it is relatively easy to use, it is not as secure as other clasps. Spring clasps are probably the most widely used clasps when it comes to necklaces and bracelets. This clasp opens when a small lever is pushed backwards along a circular ring. On the other end is a small ring or hoop. Simply push the lever back and latch the open section through the hoop and close to secure. Spring clasps are ideally suited for necklaces and bracelets, they can be difficult to close, but are very secure. The toggle clasp works well with both necklaces and bracelets and can he highly decorated to match the style of the jewellery. On one end of the bracelet or necklace is a metal piece with a thick "bar", while the other end has an opening such as a hole or square. Simply insert the bar into the other end to secure. These types of clasps are not as secure as other clasps but are easy to use. A beautiful design, the fancy lobster clasp securely hooks your necklace or bracelet. This jewellery clasp allows you to easily close your piece of jewellery with one hand. To close, simple pull back on the handle and link it to the hook on the other side of your item. The fancy lobster is one of the most popular jewellery clasps. This jewellery clasp features a simple clipping function for your ease and convenience. The designer lobster clasp closes securely. A common jewellery clasp, this designer lobster style fits with any necklace or bracelet. Caring for your clasps is no different than your regular jewellery care. To keep your jewellery shining bright, clean your Necklaces and Bracelets with a professional jewellery cleaner or wash in warm soapy water. Remember to keep your jewellery in a safe, clean location and make sure your clasps are functioning properly and securing correctly. Shown below are two popular types of double security locks that feature on bracelets. To improve the safety of the bracelet, the double security mechanisms are sturdy and reliable. Please refer to the illustrations below when opening and fastening the bracelet. It is easier to fasten and open a bracelet lock with the assistance of someone else. 1. Press down on the tab on the side of the under-clasp to open and make sure it is completely loose. 2. Insert the male-end/tongue of the lock into the female end until you hear a clicking noise. You should not be able to open the bracelet once you have heard this clicking sound. 3. Secure the under clasp part by snapping it shut. You will hear another clicking sound. 1. Unhook the under-clasp portion until it is completely open and loose. 2. Apply medium pressure to the push-button on the side of the clasp while gently pulling the two ends of the bracelet lock apart. Under-Clasp Security Feature Safety Lock. 1. Insert the male-end/tongue of the lock into the female end until you hear a clicking noise. You should not be able to open the bracelet once you have heard this clicking sound. 2. Secure the Side-Safety clasp by snapping it shut over the knob. 1. Lift the Side-Safety until it unhooks from the knob. Side-Safety Security Feature Safety Lock.